From now until February 2016, indulge in a carefully-curated five-course Martell Pairing Menu (S$198++ per person) that is prepared by Shang Palace’s Master Chef Steven Ng (吴超仁) at Shang Palace (Shangri-La Hotel, Singapore). This prix fixe menu will feature exquisite dishes such as the Braised Bird’s Nest and Chicken in Broth as well as the Honey-Glazed Kurobuta Pork. Cognac experts and those looking to indulge a little more (or a whole lot more) can opt for the famous L’or de Jean Martell (S$8,888++), Martell Création Grand Extra (S$1,488++) or Martell Chanteloup Perspective (S$1,288++). Just as a quick guide, there are three main kinds of cognac - the VS, VSOP and the XO (being the highest priced). One of the things you will probably notice at Shang Palace (and especially so if you frequent this place often) is the Martell Trunk by Pinel et Pinel (luxury malletier) at the entrance. This is the result of a team of 10 artisans and 1,000 man-hours. The Martell Trunk which houses the L’or de Jean Martell (S$8,888++ per bottle) uses only the most precious of materials - full-grain leather, copper, silver plate, oak and crystal. Apart from the crown jewel, the Martell Trunk also houses an entire range of Martell cognacs as well as 28 vials of the most unique water of life (eau de vie), The Cellar Master’s Notebook (with all the handwritten tasting notes of Martell’s cellar master Benoit Fil), rare scented candles as well as a cigar humidor with an exhaustive range of accessories for cigar connoisseurs. As a regular gin drinker, I actually knew little to none about cognac appreciation - there is commonly a conception that cognac is for the more sophisticated or more developed drinkers. The five-course menu comes with four wine pairings with the first two being the same Martell V.S.O.P.. For first-time drinkers, here's a quick tip - unlike wine glasses where you hold it by the stem, hold this tulip-shaped glass in the palms of your hand. You should ideally warm up the cognac with your body heat to augment the bouquet and fragrance of this prized beverage. 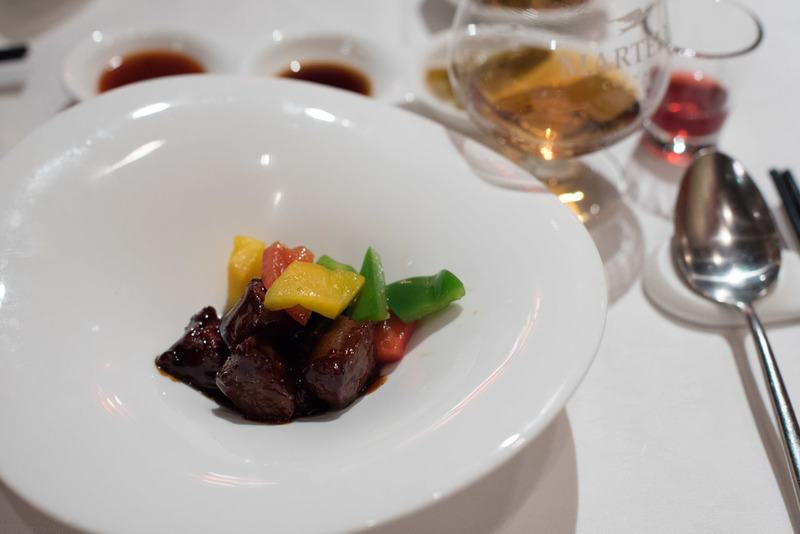 Honey Glazed Barbecued Kurobuta Pork, Braised Duck Meat with Rock Sugar and Jelly Fish (黑豚叉烧, 老檀鸭片, 海蜇) | Martell V.S.O.P. The first dish on the menu was a trio of Honey Glazed Barbecued Kurobuta Pork, Braised Duck Meat with Rock Sugar and Jelly Fish (黑豚叉烧, 老檀鸭片, 海蜇). Since I've actually started with the Martell V.S.O.P. before the dishes, my palate was already warmed up and ready to go! I started with the lightest of flavours - the Jelly Fish on the extreme right. Honestly, I've never quite gotten jelly fish in Chinese cuisine but this was seriously good! I loved the crunch and the savory sweetness in the jelly fish. I made my way through the duck meat and found myself in love with this chunky and generous serving of honey glazed Kurobuta pork - unlike your regular char siew where the charred bits are important, this Kurobuta pork was delicately flavoured; yet the flavours were truly brought to life with the V.S.O.P - I thought I tasted longan towards the end too! Braised Bird's Nest and Shredded Chicken in Supreme Broth (浓汤鸡丝燕窝羹) | Martell V.S.O.P. The second dish on the menu was the Braised Bird's Nest and Shredded Chicken in Supreme Broth (浓汤鸡丝燕窝羹). I absolutely love these flavourful and consistent broths - although I was slightly skeptical about the use of bird's nest in something savoury, I was pleasantly surprised by how well the different components complemented one another. Firstly, the broth itself is what you would expect from a quality restaurant like Shang Palace - profoundly rich and extremely tasty. The bird's next on the other hand, really helped to add texture to an otherwise consistent dish. In fact, the ladies love it because it is believed that the prized ingredient provides beauty benefits and aids in improving a person's complexion. In my opinion, any self-respecting Cantonese restaurant should have the third dish on the menu - the Wok-fried Diced Beef Fillet, Aged Vinegar, Seasonal Vegetable (碧绿老陈醋煎牛柳粒) was paired with the Martell Cordon Bleu which is largely dominated by eaux-de-vie. The citrus and vanilla hints from the Martell Cordon Bleu, alongside that amazing Aged Vinegar sauce truly helped to bring this dish to the next level. The Martell Cordon Bleu is also my personal favourite cognac for the dinner - it was amazingly-floral, easy on the palate and it delivered a satisfying long burn. Steamed Layered Cod Fish, Glutinous Rice, Dried Scallop and Crab Meat in Bamboo Leaf (竹叶糯米鳕鱼) | Martell X.O. My favourite dish of the night was paired with the best cognac we tried in the evening - the Martell X.O.. When the Steamed Layered Cod Fish, Glutinous Rice, Dried Scallop and Crab Meat in Bamboo Leaf (竹叶糯米鳕鱼) was delivered, it reminded me of a rice dumpling (which I'm pretty sure the chef has intended for it to be) but that fragrance that comes with it is unparalleled. Steamed Layered Cod Fish, Glutinous Rice, Dried Scallop and Crab Meat in Bamboo Leaf | Martell X.O. I was pleasantly surprised by the quantity and quality of the beautifully-cooked cod fish. While the fish is notorious for having a soft flesh, Chef Steven has delivered a masterfully-executed dish that has enough firmness and tenderness. The glutinous rice which is cooked with dried scallop and crab meat also soaked up some of the flavours from the cod fish, making it a delight to eat. This is by far, my favourite dish of the night (and possibly, the best dish at Shang Palace in my opinion)! While the Martell X.O. (which comes in a deeper and darker copper tone) complemented the fish thoroughly, I found it a little too strong for my liking (and this comes from someone with zero cognac experience). I loved the finish on the Martell X.O. but the body was just a little too complex for me. Finally for dessert, we tried the Sweetened Almond Cream with Glutinous Rice Dumpling (杏仁茶汤圆), which is not paired with any cognac in case you are wondering. The glutinous rice dumplings which were filled with delicious black sesame fillings were really good and even a person like me who do not generally like desserts finished it thoroughly.